Providence Capital Holdings LLC, the owner of the Woolworth Building, at 185 Westminster St., plans to convert the structure into a mixture of residential apartments and commercial units, including a rooftop lounge, according to the project attorney. The project will involve renovation of the basement and first floors into restaurant space, and the fourth and fifth floors into 18 apartments and creation of a rooftop lounge or bar, he told the City Council’s finance committee last Thursday. The building is located next to City Hall, and once housed the F.W. Woolworth department store on its street level. It will be exciting to see this building restored and put to use. There is currently a Bank Newport branch being built out on the ground floor where the AAA office used to be. I assume that means the restaurant will be on the corner facing City Hall and Kennedy Plaza. It will be good to have nighttime activity on that corner. It’s exciting to see all of the projects along Dorrance: this building, Union Trust, Case-Mead, the G, the Biltmore at one end and Wexford at the other. This is great… this street will be a vital corridor between the convention center area, KP, and the 195 land. I miss Woolworth’s but this is a good reuse for this building. Gradually a real downtown is emerging. Now let’s just tear down the Superman corpse and get on with a new building suitable to the electric needs of modern businesses instead of endlessly coming up with foolish rehab plans that keep the corpse “alive” as a zombie. This is a great start for that area of the City. There is *SO MUCH* vacant space at the entrance to the DownCity portion of Westminster. Convert it all into retail and apartments above. 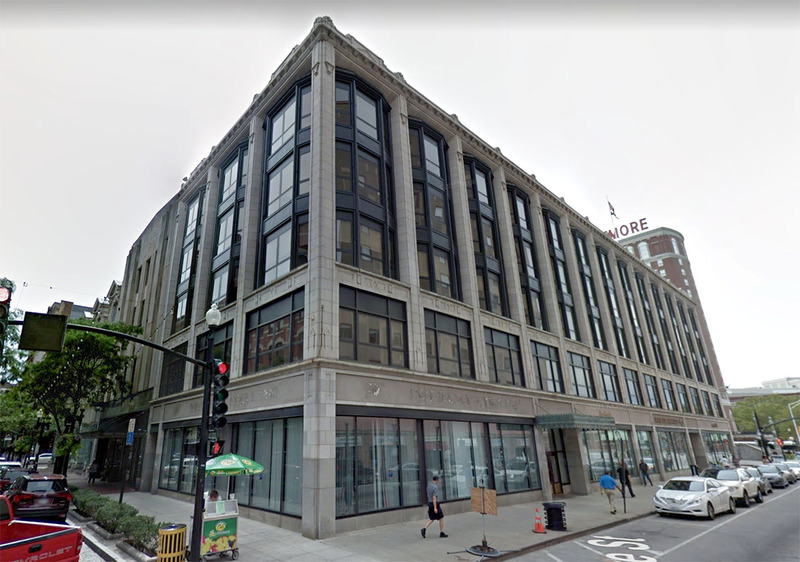 The Old Projo building itself would make great ground level retail units, then there is that other building with the facade/overhang that looks like a theater. Kind of shocking that these are the last to be re-developed in the area. Tearing down the Industrial Trust building could be the worst idea Rhode Island has ever had. The government assistance that they are asking for is not significant compared to what the project represents. The City of Providence would just be giving a standard tax stabilization agreement, the State would be making the larger commitment. Nobody would have to put any money up until the building received occupancy. What’s ridiculous is that they haven’t sat down and found common ground on this project. I would say reduce the City tax breaks and use the taxes to pay down a loan from the State. There has to be something that works for everyone. A few hundred new apartments in the center of downtown would be huge for downtown…and the lights would be on. Excited for the new rooftop bar. So glad to see these buildings receiving respect. Keep the Superman make it work, once it’s gone its gone forever. Re Superman Building: why should taxpayers of modest to strained means subsidize luxury condos or rental apartments for high income people? Tis is not how taxes should be used. That building is not economically viable, especially as a discriminatory public project for the well heeled. Hopefully part of a Superman rebirth would include a public component. The Superman Building will never be rehabilitated. It’s now five years a corpse. Will it be ten more years a corpse, or twenty? Public money should not be provided to make condos/rentals cheaper for the well off. Please make your case case – other than nostalgia – for public financing of the Superman building, including what will happen when estimated costs become exceeded and then far exceeded, as is normal in rehabbing old buildings. And bear in mind that old buildings like this are being abandoned everywhere for business use because their electrical systems are far too low, and not easily upgraded, for modern, computer driven businesses. Which is why it is totally embarrassing to show this corps to tech companies considering Providence, givng these companies the correct impression that the boosters of this building do not have a clue about the needs of tech businesses, or any modern business.